If you remember recently, I posted about Cosmedic which is a dermatologist formulated and approved skin care solution brand and as I promised I will put up a review about their product soon. 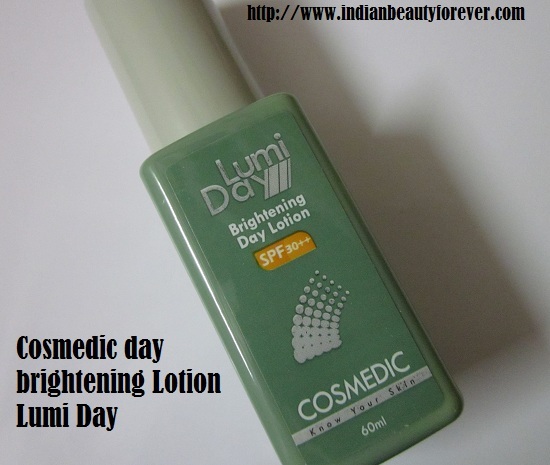 So here I am with the review on Cosmedic Brightening Day Lotion Lumi Day. I have been using it for around 3 weeks and it’s high time to review it. 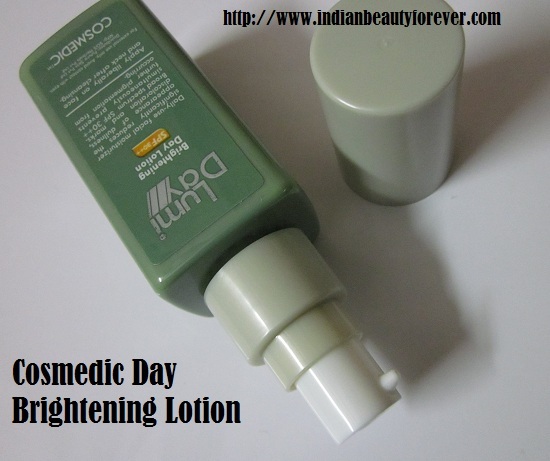 Price: It comes for 350 Rupees for 60 ml and has a shelf life of 2 years. About the Product: Daily-use facial moisturizer significantly reduces dullness and discoloration while correcting the appearance of marks. Our proprietary Concentrated Hydroxy Complex delivers a potent mix of 4% Alpha Hydroxy Acids combined with Natural Moisturising Factors for gentle yet effective results. Broad spectrum SPF 30++ simultaneously prevents further pigmentation from occurring. Free of hydroquinone, steroids, and other irritating demelanizing agents. Hypoallergenic and Non-Comedogenic! Ingredients: Concentrated Hydroxy Complex with 4% Alpha Hydroxy Acids, Natural Moisturising Factors, SPF 30++. Complete list mentioned on the picture below. Directions to Use: Apply liberally to face and neck after cleansing daily. Caution: Avoid contact with eyes. Store product in a dark cool place. For external use only. My Experience: This day brightening Lotion is especially formulated for the blemishes, pigmentation or any discoloration on face. I have pigmentation around my chin and some blemishes on the cheeks due to which I was looking for a skincare solution that can help reduce and lighten them. This lotion comes in a pump dispenser which is very convenient and hygenic to use. Like I say I prefer pumps more over the jars. Packaging is teal green color rectangular pump dispenser. Nice it is !! When I first used it I realized that it gets absorbed after a little massaging and my face looks glowy. (don’t worry it is oil free). Here is how it looks when it gets absorbed.It has a quick absorbing formula. If I am going out then I apply my foundation over this and compactor else when i am at home i use this only after properly cleansing my skin. 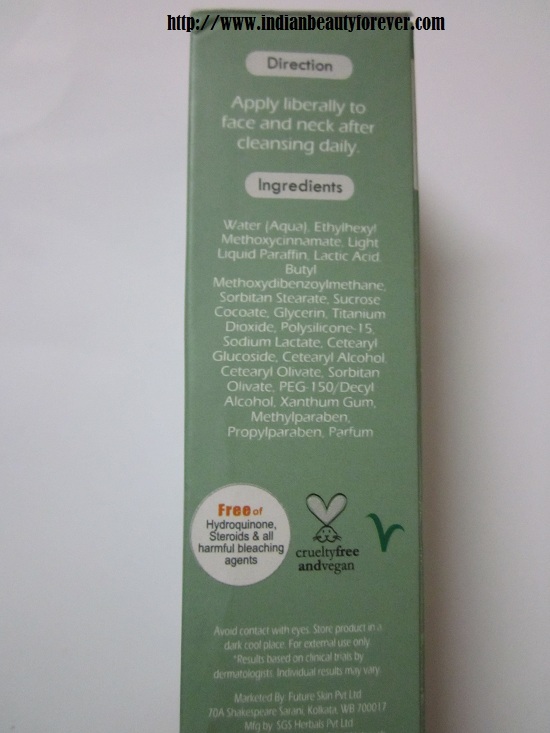 I am glad that it is hypoallergic, oil free and non comedogenic. That’s great, Isn’t it ?? As whenever I think of using a skin care product the first thing that comes to my mind is that it should be non comedogenic as I have suffered from whiteheads earlier and do not want to invite them again. An also I do apply it on the normal parts of my face but not on the nose which is very oily. During the time I have been using it, I realized that it has definitely improved my skin tone and texture. My skin was more even toned and better than before. About the pigmentation around the jaw area, I have seen faint improvement, may be it needs some more time to work on that which is fine for me. It has SPF 30 which gives sun protection and makes it a great day lotion that can also provide moisture due to its moisturizing factors, It has Alpha hydroxyl Acids (AHAs) that helps reduce discoloration and dullness. so for me its like all in one product that is taking care of the targeted area and problems. I also asked my mom to use it and she liked it a lot since its formula suits her dry skin so for her, it can be a great day cream. She has already asked me to purchase it and even I think I would buy one for me once I finish the bottle I have. 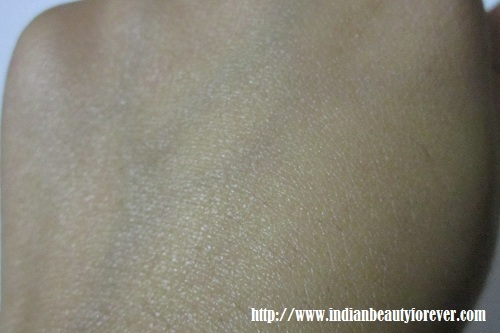 It is not actually a drawback but I want to test it more to see the results for the pigmentation. It's not for the very oily skin types as you may then feel oily and shiny. My take: Effective product at an affordable price that does take care of your marks, pigmentation and dullness. PR sample for consideration, which has not affected the review in anyways. I am using it these days. I suits my acne prone skin and in the meantime takes care of the marks and pigmentation too. I like the fact that it is hypo allergic and non comedogenic. Deep pore cleaning and steaming helps a lot. I tried so many methods but these are the two that has benefited the most. I still do them so as not to invite them again. Okay this one is on top of my wishlist now !! Seems nice and not expensive either. I am using one from Amway and that ridiculous is a small word to describe its price. Seems this one does the same job and is much pocket friendly. Will definitely check it out. It has worked fine for mum n me. she has very dry skin but i do not think so i will be using it much in the summers in Delhi, being blessed with oily skin .:P. but for dry skin it can be used all round the year.